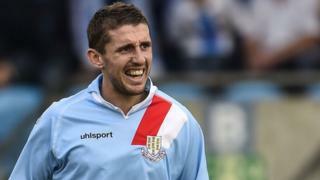 Gary Thompson's injury-time equaliser gives 10-man Ballymena a point against Glentoran at the Showgrounds. Home skipper Allan Jenkins was sent-off early on, with Fra McCaffrey converting the resulting penalty. Darren Boyce scored a superb equaliser, Aaron Hogg saved Ally Teggart's penalty and then Jordan Stewart put the Glens ahead, before Thompson's late intervention.